You may have heard the acronym SEO from a colleague or thrown around in discussion about web design. Search Engine Optimization is all about increasing the online exposure of your website to get the word out about your cause. However, doing just that isn’t so easy. More accurately, SEO is all about competing for online exposure on search engines...even as a nonprofit. The good news is that generating great SEO comes naturally, or organically, as search engines say. This stems from publishin high quality content on your website which search engines will reward you for. 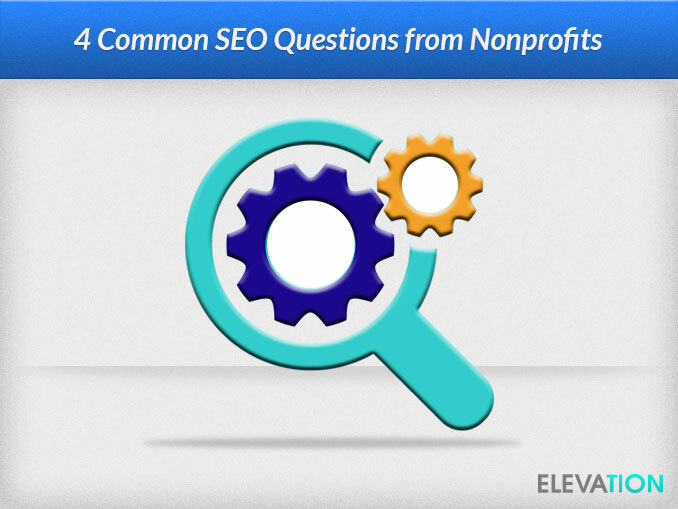 So how does SEO function and why as a nonprofit do you need it? Continue reading, and as always, feel free to contribute to the discussion in the comments section. Search engine optimization (SEO) is "the practice of increasing the quantity and quality of the traffic that you earn through the organic results in search engines," (Rand Fishkin). Still confused? Let’s break down this definition. Quantity: More visitors to your website means more exposure to your nonprofit. Simple enough. Quality: However, while you may think any exposure is good exposure, this couldn’t be more wrong. The whole point of a online search is that you get the absolute best answers. This means, when you google “Nepal earthquake”, you don’t want “great Nepalese restaurants” to be listed in the results. Generating quality traffic will attract visitors genuinely interested in your nonprofit. Organic: When starting a google search, two types of results are listed, organic and paid. Organic results are those closest to the search query based on relevance, and paid results are advertisements. Search Engines make a clear distinction between these when the search results appear. When someone starts an online search and clicks on your nonprofit’s website, will they be satisfied with what they find? This is the main question search engines try to answer every time a query is submitted. So how do search engines measure the value of the billions of websites on the web?Crawlers. These internet spiders travel to various websites to grade the value of their content. They are analyzing sites based on their relevance, authority, and trust - arguably the 3 pillars of SEO - in relation to specific keywords. Part of SEO is discovering what crawlers are looking for and how to ensure that they respond positively to your website. Relevant Content: Your website, blog, social media accounts, etc want to offer rich, valuable, and insightful information to visitors. Before you start writing, it’s a good idea to do some keyword research to see what topics people are already searching for in the field. Then, you can start producing content that focuses and provides valuable information that connects to those keywords, and is helpful to your audience. Authority: Writing great content should be a segue into building excellent online authority (reputation). Crawlers respond positively when they see that other related websites are linking and referring back to the content on your web page. Building strength and credibility in the field is one of the most powerful ways to impress search engines. User-experience: Is your website easy to use and navigate? You want the user experience to be as straight forward as possible, void of murky or unclear elements. Adopt an open-source CMS such as Wordpress, Drupla, or Joomla, and remove any flash plugins that slow loading times. Furthermore, ensure that your site is mobile-friendly and create a sitemap to organize the content of your site. 3. How will SEO benefit your nonprofit? You may think spending time and money on marketing materials is counter-intuitive to your foundation as a nonprofit. And even if you were interested, money is almost always pretty tight. However, incorporating SEO into your marketing and outreach strategy is not only one of the more cost effective options out there, but it can also yield major results for your nonprofit. SEO can lead to a raise in membership, better authority in the field, a boost in donations, and most importantly, increased exposure to your cause. There are endless amounts of sources to access that will walk you through the next steps of SEO for your nonprofit. Guides, blog posts, infographics, and more are at your choosing. If you're ready to jump headfirst into optimizing your website on search engines, I suggest reading Moz's Beginner's Guide to SEO front to back. Not only will it go over the basics of SEO, but this guide offers valuable and free strategies that you can start employing right way. Other resources that offer valuable tips, blogs, and guides are Search Engine Land, Moz, and Quicksprout. Whether you are in the preliminary stages of web design or are interested in redesigning, jump starting SEO with these two processes is often more cost and time effective. Contact us today and we would be happy to discuss the various ways our web design methods coalign with SEO. If you have previous experience with SEO, share your thoughts! What are some tips that helped you understand SEO better? How has SEO benefited your nonprofit?